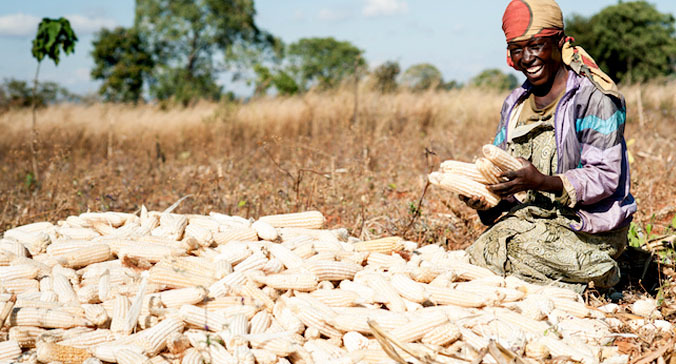 The purpose of the rural livelihoods component is to enable a higher proportion of farm households, who are not yet market oriented, to achieve levels of production that enable them to take advantage of the opportunities offered by the market linkage and infrastructure component. Farmer Groups are more cohesive and better governed; and vulnerable households have joined the groups. Output A.1a. Capacity of Farmer Groups to plan and implement group activities built. Identify priority agricultural enterprises and natural resource management initiatives; and map group capacity development needs. Group capacity building to address the identified needs in areas such as: group governance, leadership and group dynamics, visioning, gender action learning system (GALS), business action planning, basic financial literacy, record keeping and savings mobilization. Community mobilization and sensitization as well as participatory planning was undertaken by the sub-county CDOs supported by agricultural extension staff, the parish chiefs and village executive committee members. Where required, specialized service providers were recruited to train local government staff in these areas, as well as in project monitoring and supervision. Group capacity building activities are being delivered by District Farmers Associations (DFA) in collaboration with relevant Local Government staff. Community Based Facilitators (CBF) have been recruited to serve as a critical link between the lowest level of the local government administration in the relevant sectors and target groups at village level. Output A.1.b. Capacity of vulnerable households to identify and solve their problems strengthened. PRELNOR is scaling up the household mentoring approach successfully tested under the District Livelihood Support Programme using household mentors to work with vulnerable households not linked with community groups and activities. Mentored households that make progress will receive a small food security grant (worth about USD100 each) to assist in boosting household food production and / or generating some cash income. The project target is to successfully mentor 10,000 poor vulnerable households and ensure they participate in agriculture related initiatives and income generating opportunities. The most vulnerable youths are being targeted by the household mentoring process, as child heads of households, or as members of their parents’, relatives’, or guardians’ households in the case of orphans. Output A.2.a. Capacity of farmers built in relevant climate resilient crop production systems. Cropping areas and yields will be increased through timely use of appropriate mechanization, land use and cultivation practices. The project will strengthen the capacity of rural poor farming households to increase production and productivity of food security and marketable crops. The overall aim is intensify farming systems through resilient practices while conserving the natural resource base (soil and water). While most of the interventions require only an investment of time and change of production practice by farmers, the main investments focus on capacity building to enhance the knowledge base of the stakeholders for sustainable agricultural development and to empower the farmers to adopt the improved practices. For a start, the main crops addressed through the project are the main crops in the area, namely maize, cassava, beans and rice but PRELNOR will respond to changes in market demand for these and other crops grown in northern Uganda. Capacity building for implementing agencies (LG, DFA and other service providers) and supervising partners to ensure the activities are delivered effectively. Output A.2.b. Natural Resource Management initiatives which complement resilient crop production systems implemented. PRELNOR is promoting best practices in community based natural resource management (CBNRM) and introducing climate change adaptation measures at both the catchment and household levels as a basis for the climate resilient crop production systems. The focus is on capacity building of targeted communities in sustainable CBNRM practices and providing incremental financing support to assist communities in the implementation of their CBNRM plans. CBNRM plans will be supported by one-off incremental grants of up to USD $6,000 to village groups to help implement these initiatives, including rain water harvesting activities planned for the community access road (CAR) program. For the innovation grants (each up to a maximum of USD 6,000 each), the project is exploring the approach developed under the World Bank funded Northern Uganda Social Action Fund (NUSAF). Innovative CBNRM interventions will be approved by the DTPC sub-committee for PRELNOR and recommended to the CAO (of the respective District Local Government) and PMU for funding. Further elaboration of the governance arrangements for CBRM innovation grants and PHH grants, are being done. Output A.2.c. Agro- metrological information routinely collected, analyzed and disseminated. Investments in improved meteorological monitoring and climate information services to address the increasing climate variability identified by farmers as a constraint to the agricultural productivity in the Acholi sub-region and Adjumani district. PRELNOR will support the meteorological services at district and national level to improve climate data collection, analysis and dissemination to farmers to enhance farmers’ coping and adaptive capacities, complementing ongoing initiatives. A total of 21 automatic weather stations; 15 new ones, and 6 existing ones will be procured and rehabilitated respectively. A total of 18,000 household farmers will receive weekly 10-day and seasonal weather forecasts throughout the year in form of SMS. The dissemination of weather information using SMS will be effected by developing and installing a weather information platform to receive weather information and subsequently sending it to the registered farmers. Awareness creation on utilization of weather information and agricultural adversary services among the farmer groups will be conducted. Output A.2.d. Biophysical monitoring system established and operational. Eight sentinel sites, based on the “Land Degradation Surveillance Framework”, will be established across the project area supported by high resolution imagery to complement the initial site in Nwoya District established through the CCAFS-CIAT programme. This investment will provide the basis of a long term biophysical monitoring and evaluation system for each district.